Green GYM is a new type of fitness club, combining sports and café together. At the GYM space, experienced trainers from the field will fully support your physical makings. Feel easy, for we also rent out towels and changing clothes, so that there will not be any problem even if you suddenly feel like moving your body, or feel like working out after work! Feel free to drop by empty-handed. After working out at the GYM or the simulation golf, you can relax at the cafe space where only sofas are used for sitting. Green GYM is a new type of GYM & CAFE, where you can use the facilities according to your mood of that day. Green GYM is just 1 minute walk from the Tokyo Metro Chiyoda line, Akasaka station. Accessible from Roppingi, you can just drop by during the holidays or even after work. You don't have to GET READY. No need to bring anything special! At Green GYM, you can rent any equipments such as bath towels, face towels, T-shirts, gym shorts, socks, training shoes, etc you need for working at gym. Our members can just drop by anytime, even after work or during shopping. All rentals are free for Green GYM Master members. Simulation golf is also free of charge. Green GYM Master members can use the simulation golf on the B1 floor for free. We also rent out clubs and gloves. All installed machines are Italian made, state of art machines. 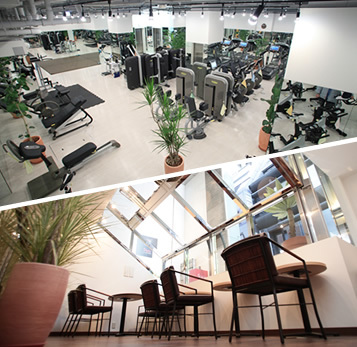 All fitness machines installed in the sports GYM on B2 floor are the finest and latest models from Technogym. ※Last entry for the day is 60 minutes before the closing time. Business hours and fixed holidays can be changed without prior notice.